The weather was lovely yesterday and is again today. We are taking advantage of it by laying large blankets under the big tree in the shade and are trying to sort out the shed. We have pulled everything out and are trying to group the items into categories so that there is a little order to the vintage treasures we have sourced for the online shop. Yesterday was TOYS, my favorite category. This is such a process! Once sorted into groups the items need to be cleaned, photographed, cataloged and finally loaded onto the shop for sale. This is definitely not going to make us rich anytime soon, but hopefully it will generate interest in the other lines of business that ONCE has to offer. 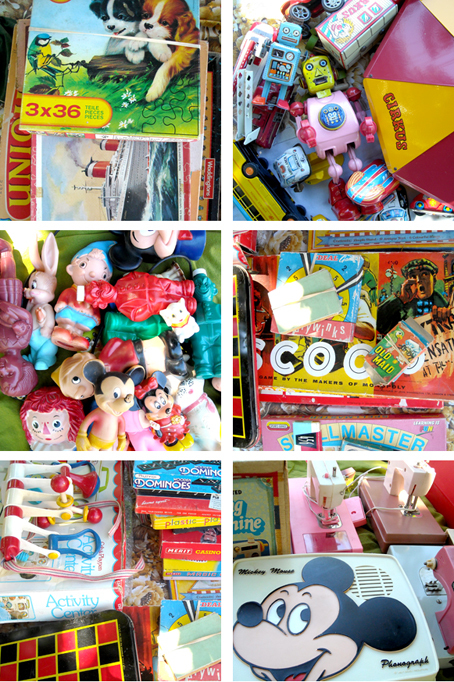 We could open a whole vintage toy shop. Little monkey watering the plants in the garden while this is happening around him.